Buyers mentioned that the Adidas Adi-Trek kept their ankles and feet very well protected from the cold as it is snugly secured in this close-fitting shoe. Some reviewers noted that the leather upper kept their feet dry during the winter months. Some have tried wearing the Adidas Adi-Trek under slight rain and its gusseted tongue kept the water out and their feet dry. Very nice looking shoe according to some buyers who tried them all day at work. The faux fur lining is appealing to very satisfied buyers. The Adi-Trek vulcanized outsole is grippy and kept the feet from sliding especially on wet and slippery surfaces, said some skaters. A reviewer mentioned that the Adi-Trek seems like a mid-top version of the Adiease skate shoe with a flexible sole. A very affordable pair shoe for everyday wear during the cold months as it keeps feet warm. Few buyers noted the Adidas Adi-Trek’s color options are very limited, with a choice between brown and black/gray combo only. Has good quality outsole but the detachable insole is very thin and does not give enough cushioning when jumping and gliding on the skateboard. Its fleece lining makes it ideal for the cold season only as it makes the feet warm and sweaty under the heat. The Adidas Adi-Trek has the same vulcanized outsole as the Adiease skate shoe that’s flexi and grippy. Its efficiently structured sole prevents the chances of slipping on icy or wet grounds. Designed for the cold and rainy seasons, the mid-top Adi-Trek is constructed with durable leather and a faux lining to keep the ankle and feet dry, warm and snugly protected. This winterized skate shoe which is available in limited colorways won't keep your feet freezing cold as it comes very affordable. Back in the day, skate shoes were bulky and ultra-padded, made of leather, and had a very thick tongue with stiff, heavy sole. In the late 1990s, skate shoe brands earned legions of followers as skaters relied more on the direction created by the skating goods labels. Needless to say, the early versions were in reality inappropriate for skateboarding, since the emphasis during that time was towards a different direction. The focus was made on the cushioned support around the foot instead of dwelling on the boardfeel, a vital aspect in skateboarding. Those awkwardly heavy skating silhouettes were gradually developed over the years as narrower designs for skate shoes started to come out. Other shoe bands took cues from their archives of trainers, designer sneakers, and soccer cleats in creating skate shoes with functional features. Adidas benefitted from its global popularity when this shoe label, widely known for its rich heritage in performance soccer cleats, leaped into the world of skateboarding to get a grip of this street sport. The DNA of its early soccer cleats somehow responded to the needs of skaters, since those field shoes relied on the “feel” or the awareness of the surface underneath the shoe. Translating such concept into skateboarding, it’s having that good boardfeel and grip of the skateboard while flipping, turning, and sliding. Skateboarding, however, isn’t only a sport to enjoy during summer. Skateboarders have found other ways to exhibit their tricks even in enclosed areas during rainy and winter seasons, such as basement parking areas, indoor parks, old buildings with wide spaces. From chunky skate silhouettes of the olden days, better-looking ones with adequate foot support, boardfeel, and grip features take center stage today. 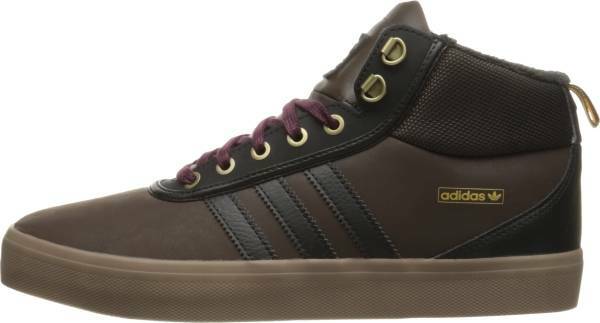 Under the Adidas Skateboarding collection, the mid-top Adidas Adi-Trek fits the category as its vulcanized outsole provides the needed grip while its faux lining and gusseted tongue give that comfort even when gliding on chilly days. The Adidas Adi-Trek is made for the colder months, as its fleece lining provides a snug protection for the foot. Its warm monochromatic earth tones are ideal for casual get up, like fitted pants or skinny jeans. Its silhouette works well in contrast with slim figured pants. One will never go wrong with its brown leather colorway combined with a pair of jeans. Not only is this winterized skate shoe meant for street skateboarding, but for casual business wear as well with a classy charm. The Adidas Adi-Trek skate shoe with medium-sized width is available in men’s sizes in 8 and 9 US. It runs true to size and has very good support and hold as it is also a fantastic skate shoe with a mid-top. The Adidas Adi-Trek resembles the sneaker profile of the Adiease with its recognizable grippy outsole made of vulcanized rubber. The sole provides the needed hold between the shoe and the surface of the skateboard for stable movement on the pavers. Another noticeable element of the Adi-Trek is its fleece inner that provides the needed warmth for the foot when skateboarding on cold conditions. It keeps the feet tucked comfortably inside free from water and ice. The gusseted tongue keeps a little water, ice, dirt, and sand from entering into the sneaker through the eyelets and the gap between the upper and the tongue. The reinforced D-ring eyelets secure the laces in place. Durable leather upper with synthetic heel cover protects the foot from getting soaked in the rain. Laces are made from polyester material. The Adi-Trek comes with a thin, without much structure removable insole. At the back of this mid-top skate shoe is a pull tab to simplify foot entry. The Adidas Adi-Trek has an EVA sockliner for the needed support. The sneaker’s vulcanized gum rubber outsole is relatively stiff but very durable.